Seating yard "Forest Camp" is located in the village of Migovo Chernivtsi region. For guests are equipped with 2 cottages for 8 and 9 persons. Each cottage has a fully equipped kitchen, on the street - gazebos and barbecues. There are 2 saunas and 2 swimming pools, in the yard - a children's playground. The view from the views of the mountains. 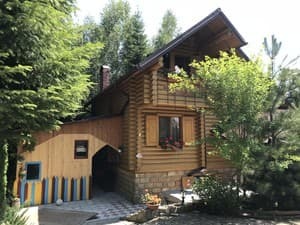 Guests can prepare yourself in the kitchen, or eat at the Hutsul Kolyba, which is located near the cottages. Gostiny Dvor is located in a closed area. In the courtyard there is a place for parking. 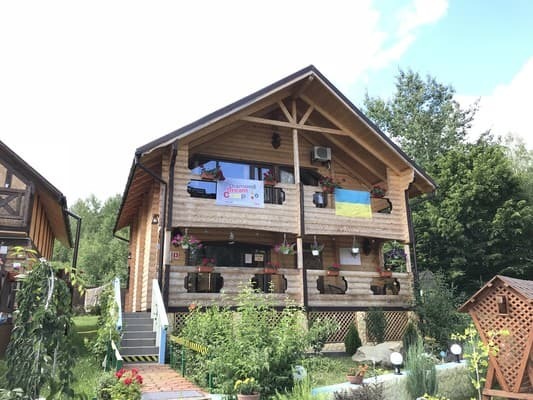 Distance from Gostiny Dvor "Forest Camp" ski resort "Migovo" is 1200 m, to the city of Chernivtsi - 60 km. Description of the room: The cottage is equipped for living 9 people, the area - 170 sq.m. Ground floor: large room (4 single beds), a kitchen for self-catering and a bathroom. Second floor: two bedrooms (1 double bed, 2-Large Double and single bed), 2 bathrooms, 2 balconies with views of the mountains, forest and garden. Near the cottage there is a swimming pool, a gazebo, barbecue, parking in a closed area. Description of the room: The area of ​​the two-storey cottage is 160 sq.m. On the ground floor there is a living room with sofa bed, kitchen, bathroom and access to the pool. On the second floor - three double rooms, bathroom, 2 balconies. In the basement is a sauna, an outdoor swimming pool (open in summer). Check arrival: from 14:00 - 15:00 hours. Check leaving: to 12:00 - 12:00 hours. Additional space on request (fee). 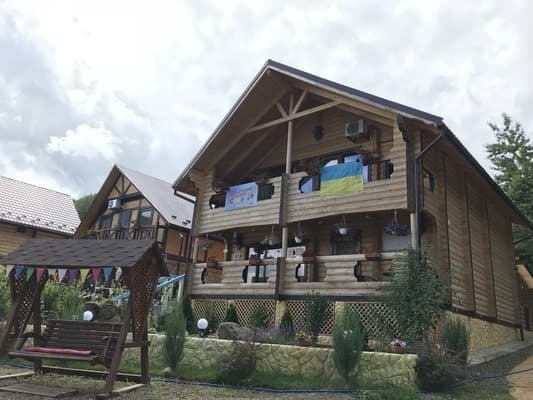 Guests can prepare yourself in the kitchen, or eat at the Hutsul Kolyba, which is located near the cottages. 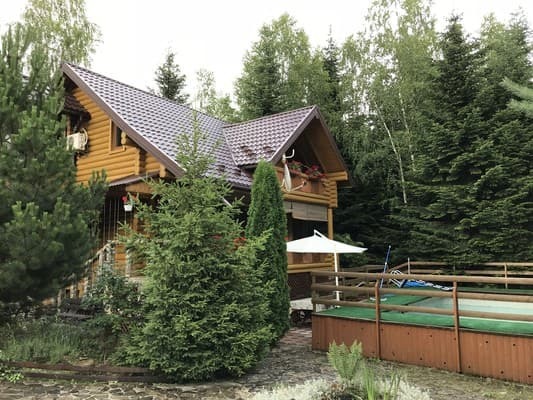 Seating yard "Forest Camp" is located in the village of Migovo Chernivtsi region. 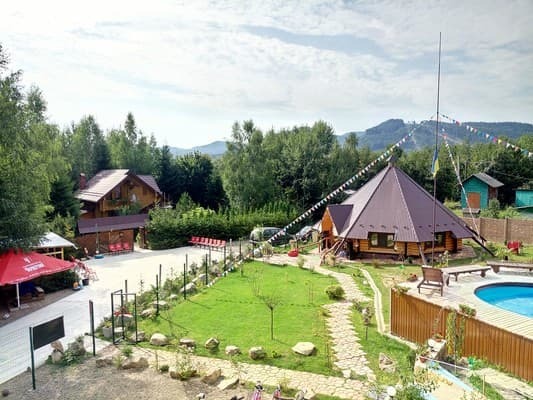 Distance from Gostiny Dvor "Forest Camp" ski resort "Migovo" is 1200 m, to the city of Chernivtsi - 60 km. By public transport: by train, by bus to the city of Chernivtsi, then by bus to minibus Migovo village. (Daily route, on schedule): Chernovtsy - Migovo 8.30 10.20 12.40 14.30 16.40 18.30 Personal transport on the route Chernivtsi Vyzhnytsia-Verkhovyna (P-62) to the CMT. Beregomet turn left at the sign in with. Migovo.